Polyclonal antilymphocyte antibodies (henceforth ALS/ALG or ATS/ATG) was the first biological immunosuppressive agent introduced into clinical transplantation with the exception of ionizing radiation. Indeed, ALS was the first heterologous antibody used for immunosuppressive effects in man. 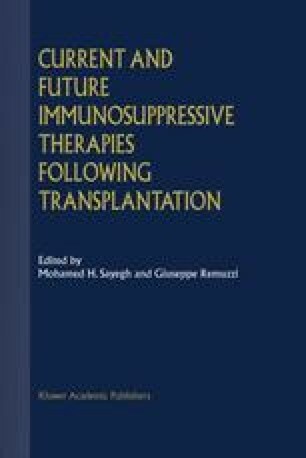 There now exist over thirty years experience in the clinical use of antilymphocyte antibodies in solid organ transplantation and in selected autoimmune disorders. An enormous literature exists which has established clear-cut and widely accepted indications for the use of ALS in man. A number of commercially manufactured antilymphocyte (ALS/ALG) and antithymocyte (ATS/ATG) preparations are currently available. In addition, many large transplant programs still manufacture their own preparations for use in their own programs. It is conservatively estimated that between 300,000 and 400,00 transplant patients have been treated with various forms of ALG or ATG. Thus polyclonal antilymphocyte preparations have had and continue to have a significant impact in clinical transplantation.